Lowest prices all the time, guaranteed! If you find a better price, let us know. Aurora Quilt bedding by C & F Enterprises will brighten your room with lively color and whimsical flowers and vines. Colors of aqua, coral, yellow, magenta, navy, and brown are presented on a white background. Quilt and shams reverse to an aqua crosshatch print. Self binding trim at edges. Aurora comes in a set with the quilt and sham or shams. Add your choice of accessories to style your room. A bedskirt in Aegean Grid has an aqua crosshatch design which is also offered in a euro sham. Another coordinating euro sham is the Manchester Aegean in a solid color with a textured geometric flower design. The Manchester Aegean euro shams are sold in a set of two. Layer with a blue feather down pillow. (Note: The white pillow embroidered in lace designs using colors from the quilt is not available). Bedding 100% cotton and machine washable. Pillows are spot clean only. The Aurora Twin 2 Piece Quilt Set has whimsical flowers and vines in lively colors of aqua, coral, yellow, magenta, navy, and brown on a white background. Quilt and sham reverse to an aqua crosshatch print. Self binding trim at edges. Set includes one twin quilt, 64"W x 86"L and one standard sham 20" x 26". We offer the complete ensemble in the Aurora pattern by C & F. Manufacturer's UPC code is 008246510529. 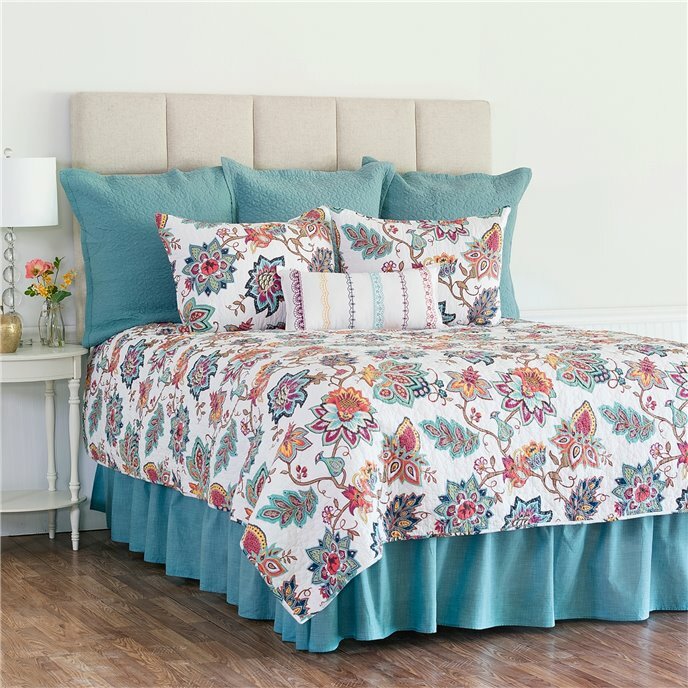 The Aurora Full Queen 3 Piece Quilt Set has whimsical flowers and vines in lively colors of aqua, coral, yellow, magenta, navy, and brown on a white background. Quilt and shams reverse to an aqua crosshatch print. Self binding trim at edges. Set includes one full queen quilt, 90"W x 92"L and two standard shams 20" x 26". Fits full and queen size mattresses. We offer the complete ensemble in the Aurora pattern by C & F. Manufacturer's UPC code is 008246510536. The Aurora King 3 Piece Quilt Set has whimsical flowers and vines in lively colors of aqua, coral, yellow, magenta, navy, and brown on a white background. Quilt and shams reverse to an aqua crosshatch print. Self binding trim at edges. Set includes one king quilt, 108"W x 92"L and two king shams 20" x 36". We offer the complete ensemble in the Aurora pattern by C & F. Manufacturer's UPC code is 008246515975.